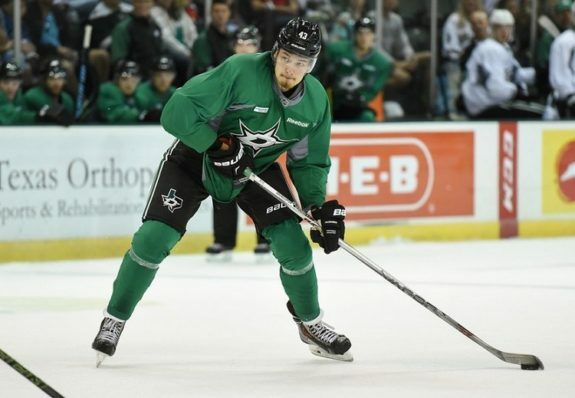 Reports out of Russia have confirmed that Valeri Nichushkin has re-signed with the Dallas Stars, returning to North American ice for the first time since the 2015-16 season. The two-year deal is expected to be announced on July 1. The Stars’ first-round selection in 2013 was at the time a steal, falling into general manager Jim Nill’s lap at No. 10. Ranked as the No. 2 European Skater on NHL Central Scouting’s final list of prospects, the Chelyabinsk, Russia, native was widely considered to be a top-three or top-five pick in the draft, but the always-feared “Russian Factor” took its toll on the 18-year-old on draft day. Reports out of the combine revealed that Nichushkin had some attitude problems and didn’t take the testing seriously (or just didn’t take it at all), which was ultimately his demise. Many viewed the hulking Russian forward as a talent, but one who was likely to be a Russian attitude-laden bust. 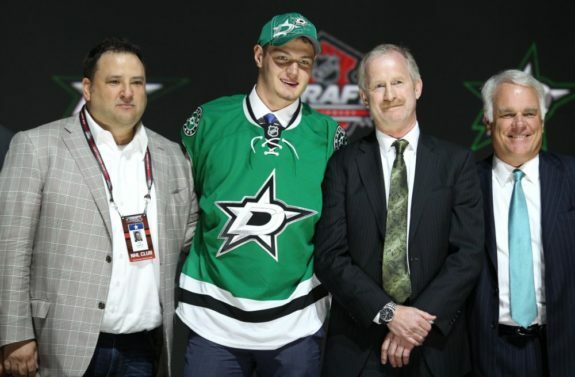 While many teams said “no thanks” to Nichushkin, Nill gave him a chance by selecting him with the Stars’ first pick in the 2013 draft. Now, almost five years to the day, Nill is offering him another opportunity to prove he can be one of the bright young stars of the NHL. The now-23-year-old returns to Dallas after a poor early transition to the NHL. From a respectable rookie season to sitting out his sophomore campaign, it’s been an up and down journey for the young Star. After Nichushkin was drafted, there was plenty of excitement and optimism, from fans and players and coaches alike. Many were expecting another prospect that would take a few seasons to develop in the minors, but he made the jump to North America right away. The affectionately nicknamed “Nuke” quickly became a fan favorite, even inspiring his very own hashtag (#IAmValNichushkin) amongst Stars fans. His rookie season was, for the most part, a success. After being a healthy scratch just five games into the season, many were concerned there was a reason he had slipped in the draft. However, once the Russian winger settled in, he began showing flashes of brilliance. Nichushkin turned it on shortly thereafter, scoring his first NHL goal on Nov. 3 against the Ottawa Senators and then proceeding to put up six points (two goals, four assists) in his next seven games. Overall, the rookie notched 34 points (14 goals, 20 assists) in 79 games, finishing sixth in scoring on the Stars roster with an impressive plus-20, second only to Jamie Benn. Amongst the 2013-14 NHL rookie class, Nichushkin finished tied for seventh in points. Not a bad first year by any means. Young Val was making a name for himself around the NHL and was well on his way to a fruitful career in Dallas. Offseason training took its toll on the young Russian as he suffered from hip and groin soreness to start the 2014-15 campaign. Just five games into the season, Nichushkin opted for hip surgery and would not return to the team until early April 2015, appearing in the last four games of the regular season. To say he suffered from a “sophomore slump” is unfair because it wasn’t really much of a season at all. In total, Nuke played eight games with the Stars in all of 2014-15. 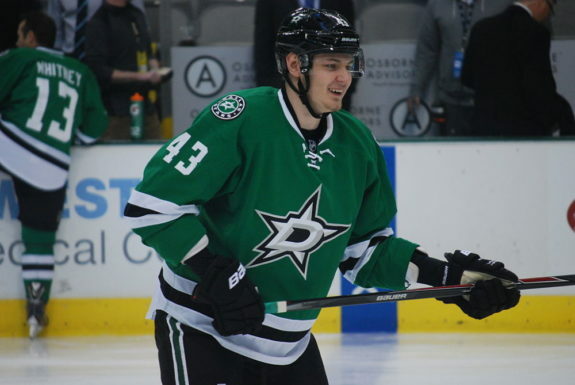 Nichushkin returned to Dallas ahead of the 2015-16 season in well-rested form, suiting up for 79 games and totaling 29 points (9 goals, 20 assists). There was a drop off in production from his rookie campaign, but that is to be expected after missing a full season of development. While Ruff never benched Nichushkin, per se, he certainly didn’t play him. As Nichushkin suggested, the third-year Star saw his minutes drop as Ruff opted to give other players more chances. The lack of opportunity and subsequent lack of production caused the frustrated Nichushkin to jump to greener pastures, signing with CSKA Moscow of the KHL to start the 2016-17 campaign. As the frustrations of the North American game nagged at the struggling Star, Nichushkin returned to his motherland on a two-year deal with CSKA Moscow. Though the Stars still retained his rights in the NHL, it was a frustrating move for everyone. A player that showed such promise as an 18-year-old rookie embodied the feared and fabled Russian Factor, fleeing to more a more comfortable situation because of a disagreement over his worth to the team. It wasn’t the worst thing that Nichushkin returned to Russia, however. The KHL is arguably the second-highest level of professional hockey in the world and spending two more years developing in a more comfortable setting wasn’t a bad thing. By most accounts, Nichushkin’s performed well. The right winger tallied 24 points (11 goals, 13 assists) in 36 games in the 2016-17 season and earned himself a spot on the KHL All-Star team. He followed that up with an all-star-worthy campaign, and a slight improvement this past season, notching 27 points (16 goals, 11 assists) in 50 games during the 2017-18 season. While rumors have been surrounding Nichuskin’s return to the Stars since the end of the 2016-17 campaign, with his contract up in Moscow, he has elected to return to North America ahead of the 2018-19 season. The signing adds more depth to an already decent Stars lineup without the team having to reach out and spend money when free agency opens up on July 1. Nichushkin’s return offers the Stars a hulking, puck-possessing, scoring option that the team has been lacking for a few seasons now. And with a new head coach (not named Lindy Ruff), that preaches a mentality of “letting the horses run,” Nichushkin should thrive in his second-coming in Dallas. Get excited, Stars fans. Nuke 2.0 is back and better than ever.